Taco Bell has a new value menu with some new items. It has 3 price points: 79¢, 89¢ and 99¢. The 79¢ menu includes: Cheese Roll-Up*, Triple Layer Nachos*, and Cinnamon Twists. The 89¢ menu includes: Crunchy Taco, Soft Taco, Volcano Taco* and Cheesy Double Beef Burrito*. 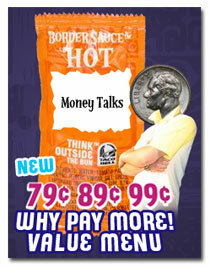 The 99¢ menu includes: Big Taste Taco*, Bean Burrito, 1/2 lb. Cheesy Bean and Rice Burrito, and Caramel Apple Empanada. 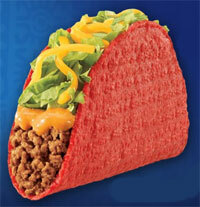 The Volcano Taco has 'real' cheddar cheese, cheesy lava sauce, lettuce, and seasoned 'beef,' all in a bright red taco shell. Don't be confused, the 'cheesy lava sauce' is not just nacho cheese sauce. As RandomVillain (sic) on eBaum's world says: "it is not nacho cheese. Tastes nothing like nacho cheese. Its called LAVA SAUCE. And it is the destroyer of taste buds. Tastes more like chili." The Volcano Taco has 240 calories, 150 calories from fat, 17 grams of fat, 5 grams saturated fat, no trans fat, 35 mg cholesterol, 490 mg sodium, 14 grams carbs, 3 grams fiber, 1 gram sugars, 8 grams protein.